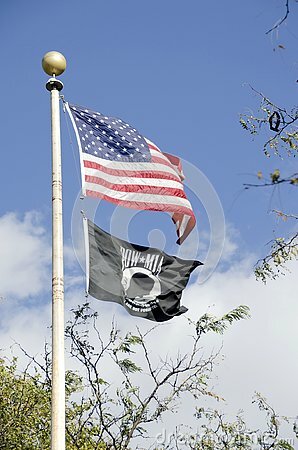 A POW MIA flag flying below the United States flag. The POW MIA flag expresses citizen concern over American military personnel taken as prisoners of war of listed as missing in action. It became visible throughout the United States during the Vietnam War. USA Flags are displayed at the back of motorbike on Czech Motor season opening. The Start of the Dawn Service, for Anzac Day Western Australia.